A 30 something girls blog. Her thoughts, emotions, and that little bit extra.. I think way too much. If I'm not thinking I'm sleeping. Today it's all aout which cars you have or have owned. I'm going to list the last 5 cars I've owned and I'd like you to list at least 2. If you've never owned a car then you can list the 2 choices of car that you think would suit you. Now, what we're going to do is make an acronym from ONE of your cars. I'll go first so you get what I mean.. now the acronym has to have something to do with cars/transport. Here goes.. Featured On Radio. DAF Finds Inexpensive Electric Sunroof. Trucks Aired! The purpose of the meme is to get to know everyone who participates a little bit better every Thursday. Visiting fellow Thirteeners is encouraged! If you participate, leave the link to your Thirteen below and please leave me a comment. It is easy, and fun! It's not about dieting, it's not about living on cabbage soup for a week. It's not about totally laying off cream cakes, biscuits, or crisps. It's about changing your lifestyle. Meaning - more exercise, less fatty foods, smaller portions, drinking water, eating slower, and at regular intervals. Oh yes I've been there done that with the cabbage soup diet, I've done the banana diet and all the other diet fads out there. What I'm come to realise is I NEED MORE EXERCISE. I have to admit I'm a couch potato. Isn't that an awful thing to admit? It's true though. I seriously lack motivation. I'm fine once I'm out there doing it, it's just getting there. So that's it, I HAVE to motivate myself, or at this rate I'll have a heart attack. There's only so long one can sit at home scoffing crisps and biscuits all day sitting at the computer longing for the next snack attack. Oh no, that has to stop. I also know that only I can do that, only I can change how I live my life. So it started on Monday (why do we always start on a Monday btw?) - Monday I cycled 12 km, and Tuesday I cycled on my 'indoor' exercise bike for 8km. I bought myself some new trainers and some jogging pants and today I walked 8km. Now that's what I call MOTIVATION. Update from last post - I didn't sell my sunbed boohoo! Oh well I have another 2 months to sell it! My sunbed is for sale. The thought of moving it to our new house and setting it up again is a nightmare. It's so heavy and bulky, plus it takes up too much room. The last time I used it was in 2004 for my wedding, so basically it's just been sitting there ever since. I've had 2 people interested so far, but neither have given me a definate 'Yes'. The least they could do is come and have a look, it's not as if I'm charging the earth. I swear people want something for nothing these days. Other than that, I need to have a good sort out. I've got so much junk it's unbelievable. I think it would be daft to move everything if I don't want to keep half of it. So it's off to E-bay we go! So when my mom had a special delivery yesterday I was thinking .. what the!! I thought I'd forgotton, until I realised here in The Netherlands mothers day falls on the first sunday of May, this year it's the 14th. Phew! My sister who lives in England sent my mom a mothers day card and gift. My mom is so lucky, she gets to celebrate it twice. So anyway, I was thinking.. isn't it about time they had a daughters day? The first round didn't go too well. David lost his first match, but went on to win the next 2. 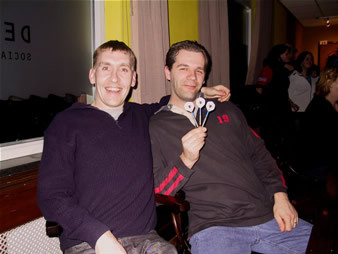 Hubby won one of his, but he's not really a darts player -- he'd only gone to play for a bit of fun. Mind you, when he had to throw double 13 to get out, his dart hit exactly the right spot. Yeehaw! Then it was time for the experts to show us how it's done. First came Daryl Fitton, and yes they played "One Step Beyond". For a minute or two it felt like we were about to watch a match at 'Lakeside'. 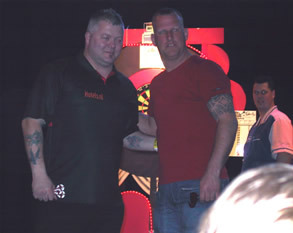 After Daryl came Gary Robson and then Gary Anderson.. plus another few. But, argh! 8 hours later and we were still there. The guys still had another couple of rounds to go, and it was already creeping towards midnight. My mom who was with us wanted to go home, so I took her. Then I went back to see how things were going. A lot of the players had given up and left, I suppose they didn't expect it to take this long! My brother felt ill, okay so it was kinda self inflicted. He'd had a few beers and hardly eaten anything during the day, apart from 2 boiled eggs. It didn't help that he'd mixed his beers too. He wasn't pissed or anything, he just felt so ill. So anyway after another half hour or so, they decided enough was enough and we went home. My brother David, on the left of the photo, was sick 3 times ughhh, thank gawd we'd got him out of the car before he barfed LOL. He says he'll never drink again.. I guess we'll see eh! We live in a sleepy village in the South of Holland and to be quite honest there's not much to do in the evenings. 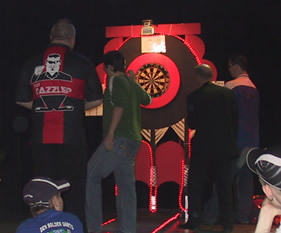 But, for some reason they come here to hold darts tournaments and top stars visit quite often to play the locals. Even more strange, the village that we're moving to in June is even more sleepy than where we are right now, yet there's no shortage of darts events. 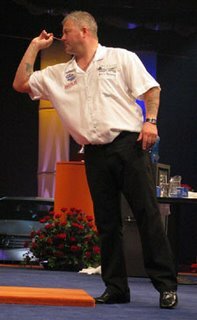 So, we're off to a darts tournament later today. Top stars such as Daryl Fitton, Gary Anderson and Gary Robson will be there. My hubby and my brother David have decided to play in the tourny. Should be fun! Anyhow, I'll let you know what happens. Guess I should go and get ready, we have to leave in an hour. Even so, I didn't expect it to be this soon! Still, it gives me time to do all the stuff I didn't have time to do before. Things like blogging lol, and gardening ughh (I thought I'd gotton out of that), packing! yeah we're moving to that 4 bedroomed house I mentioned, with garage. It'll probably be at the beginning of June, so that gives me plenty of time to sort everything out. I'm not looking forward to clearing the attic out though, there's so much stuff up there it's unreal. Dare I say it's mostly hubbys stuff? He doesn't agree, of course.. he says it's ALL mine! But then, you know what men are like huh? I can get back to my other hobby too, photography. Not that I'm THAT good, but it keeps me busy and I simply have to make a new online album, since hubby 'accidently' deleted my other one.